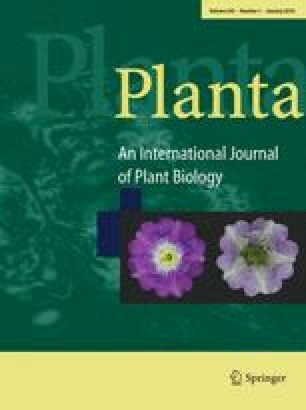 Sucrose uptake and partitioning in potato (Solanum tuberosum L.) tuber discs were examined under a range of mannitol and ethylene-glycol concentrations. Mannitol caused the same changes in turgor over a wide range of incubation periods (90 min-6 h), indicating that it did not penetrate the tissue. In comparison, ethylene glycol reduced turgor losses but did not eliminate them, even after 6 h. Between 100 mM and 300 mM mannitol, turgor fell by 350 kPa, compared with 35 kPa in ethylene glycol. Uptake experiments in mannitol alone showed that total sucrose uptake was strongly correlated with both osmotic potential and with turgor potential. In subsequent experiments sucrose uptake and partitioning were examined after 3 h equilibration in 100 mM and 300 mM concentrations of mannitol and ethylene glycol. Total sucrose uptake and the conversion of sucrose to starch were enhanced greatly only at 300 mM mannitol, indicating an effect of turgor, rather than osmotic potential on sucrose partitioning. The inhibitors p-chloromercuribenzenesulfonic acid and carbonylcyanide m-chlorophenylhydrazone (CCCP) both reduced sucrose uptake, but in quite different ways. p-Chloromercuribenzenesulfonic acid reduced total sucrose uptake but did not affect the partitioning of sucrose to starch. By contrast, CCCP inhibited total uptake and virtually eliminated the conversion of sucrose to starch. Despite this, sucrose uptake in the presence of CCCP continued to increase as the mannitol concentration increased, indicating an increase in passive transport at higher mannitol concentrations. Increased sucrose uptake above 400 mM mannitol was shown to be the result of uptake into the free space. The data show that starch synthesis is optimised at low but positive turgors and the relation between sucrose partitioning and the changing diurnal water relations of the tuber are discussed.